This spring, a pair of mourning doves returned to our house to build their nest. Last summer they raised three broods of young birds, caring for them until they flew away on their own. This year, the mating pair carefully arranged sticks and soft materials, and eventually eggs appeared in the nest. Just last week, two babies emerged—ugly and scraggly—and the parents lovingly shielded them from the weather and brought them food. But their protection was ultimately not enough. This morning, after a day of severe storms in our area, the nest was gone. Washed away. Blown away. Gone. I saw the mother bird flitter up and perch where the nest had formerly been. Inspecting. Searching. Poking her head about the spot. And I felt for her, the poor bird. Her babies were gone, and there was nothing she could do about it. In some ways, this is a snapshot of what the tornadoes did yesterday. The storms have wiped away homes. Blown away livelihoods. And snuffed out life itself for some. And we are left like that helpless mother bird, inspecting, searching, trying to make sense of what happened. For some, our babies have been taken from us, and despite our best efforts to protect them, there is nothing we can do for them. But the mourning doves have not given up. Later this morning, I saw the same mating pair rebuilding their nest in a nearby spot—hopefully a more secure spot. They were apparently starting over, doing what they do: making a nest where they will hatch more young and continue the cycle of life. It may be inappropriate to ascribe human emotions to a pair of birds, but I believe they are driven by hope. They keep plugging away, because that’s what they do. And we who have faced loss are like those mourning doves. Constrained by hope, urged on by the firm conviction that all is not lost, we start building again. Of course, our rebuilding is not a denial of what has happened to us, but it is an affirmation that God is not finished, and that one day he will wipe away all our tears. But until that day, we put our trust in God, we allow hope to fill our sails, and we keep building. In case you haven’t been paying attention this past week, Donald Sterling*, owner of the L.A. Clippers has been banned for life from the NBA and fined $2.5 million. In addition to being slapped with heavy sanctions, Sterling will likely be forced to sell the Clippers, even if he stands to make a ton of money on the deal—but that’s another story for another day. What, you may ask, was Donald Sterling’s transgression? Well, in case you have been living under a rock, Sterling was recently recorded** by his mistress*** spewing offensive racist comments. A celebrity gossip Web site broke the story, and the response from basketball players to cultural commentators to even the president of the United States has been swift in rightly condemning Mr. Sterling’s comments. Actually, some of the responses have condemned Mr. Sterling himself, and not just his comments. Follow me here for a second: 1) Mr. Sterling’s racist comments are repulsive, and they betray an apparently stable attitude and worldview that he has espoused for many years. 2) For my limited knowledge of professional basketball, the NBA was right in their disciplinary action against Mr. Sterling. 3) An accepting and multicultural society like ours needs to address poisonous attitudes and encourage mutual respect among all people. However, I wonder if our culture hasn’t gone too far. It seems that every few months we (with cheerleading by the media and our cultural Sirens) root out another person in our midst who is unacceptable to us, we flog him or her with righteous indignance, and we throw him or her away into the garbage dump for bad people, feeling collectively better about ourselves for having exorcised some social evil embodied in that person. And it’s not just one type of person with one type of political persuasion that receives the scorn and shame of an entire nation; everyone is already on their last warning to keep their thoughts and behaviors in check, lest they, too, be cast into the outer darkness. But as a Christian leader, I am concerned that we condemn people so readily and close out the possibility of forgiveness and restoration. Think with me another second: What if Donald Sterling were to publicly apologize for his racist attitudes and behaviors? **** And not just the politically motivated non-apology that says, “I’m sorry if you were offended by my comments.” But what would we as a society do if he had a genuine change of heart, publicly repented and turned to God,***** and asked for forgiveness? Would we accept him and give him another chance? Or is Sterling’s sin one of the many unpardonable sins we have in our culture today? As Christians, forgiveness is at the heart of who we are. We have been forgiven of our sins, so we must be ready to forgive others for their sins (see Colossians 3:13b). It’s what we do. Even Jesus—to Peter’s dismay—told his disciples that they must keep forgiving others who offend us, because God keeps forgiving us when we offend him. So if I can offer yet another voice to this conversation about Donald Sterling and racism, it would be this: Yes, we need to gently encourage others toward respecting and loving all people, but yes, we also need to practice humility when faced with the temptation to condemn others. And while we’re at it, why don’t we all take a second and pray for Donald Sterling. * Born in Chicago in 1934 as Donald Tokowitz. ** Apparently without his knowledge or consent, which is actually illegal and inadmissible as legal evidence in California. *** That is, not his wife, Rochelle Stein. Apparently adultery is acceptable in the NBA. **** Not to mention his adultery. I was getting ready to blog about Mark Driscoll’s decision to quit social media for the remainder of 2014 and to “reset” his life, when something else–something much bigger–caught my blogging eye. Driscoll’s own words point to part of the problem in American Christianity: too many pastors only want to be celebrities and not pastors. But Pastor Steven Furtick of Elevation Church in Charlotte, North Carolina, goes beyond the celebrity pastor mold. Something else is going on altogether. Despite his own recent controversies about staged baptisms, Furtick is apparently heralded by his own church leaders and congregation as something more than just a pastor. Or even more than “just” a celebrity. The “Reasons Elevation Church Is the Best Place to Work” document on their Web site is downright chilling, especially for Protestants like me who are allergic to the exaltation of one man. The #1 reason makes Furtick sound more like a prophet than a Southern Baptist preacher: “We serve a Lead Pastor who seeks and hears from God.” Hmm. #3 sounds more like propaganda for a dictator than the description of a pastor: “We serve a Lead Pastor we can trust.” Ditto for #7: “We serve a Lead Pastor who pours into us spiritually and professionally.” And #16 sounds downright un-Christlike: “We serve a Lead Pastor who goes first.” Yikes. Perhaps the most disturbing word in all of those reasons is “serve.” Like the pastor is a “master” who needs to be “served”? Or a “lord” who receives the “service” (as in worship?) of his servants? Very scary. 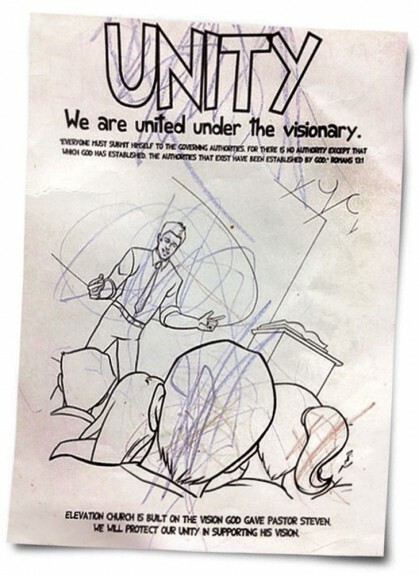 The coloring page from Elevation Church just reinforces the messianic status of the legendary capital-L, capital-P Lead Pastor (shown at right). If I could say anything to pastors who strive to become a celebrities (or more), if I could say something to aspiring pastors who have ambitions of building themselves a kingdom, I would say, “Don’t.” Just don’t do it. Model yourselves and your ministry after Jesus, who became a servant and lifted up meekness as the pattern of God’s kingdom. The world has plenty of celebrities and false messiahs. But the world needs more humble servants who serve the true Lord of lords. I found this wonderful story about Billy Graham and Albert Einstein—of all people—shared by pastor and author John Huffman. In January 2000, leaders of Charlotte, North Carolina, invited their favorite son, Billy Graham, to a luncheon. Rev. Graham initially hesitated to accept the invitation because he struggles with Parkinson’s disease. But the Charlotte leaders said, “We don’t expect a major address. Just come and let us honor you.” So he agreed. Even fourteen years later, Billy Graham is still around; he hasn’t used that suit for its second occasion. But his message is still powerful and relevant. His story invites us to ask the question of ourselves: Do we know who we are (and whose we are), and do we know where we are going? Many thanks to Brian Zahnd for sharing his “problem” with the Bible. This is an excellent little meditation on hermeneutics (even though he doesn’t use that word). When we read the Bible, who do we identify with? Who is telling the story of Scripture: Is it a minority report, or a majority report? One of the most remarkable things about the Bible is that in it we find the narrative told from the perspective of the poor, the oppressed, the enslaved, the conquered, the occupied, the defeated. This is what makes it prophetic. We know that history is written by the winners. This is true — except in the case of the Bible it’s the opposite! The church as a gas station. For some people today, the church is a place where you fill up your spiritual gas tank when you’re running low. Get a good sermon, and it will keep you going for the week. The church as a movie theater. For many people, the church is a place that offers entertainment. Go for an hour of escape, hopefully in comfortable seats. Leave your problems at the door and come out smiling and feeling better than when you went in. The church as a drug store. For other people, church is the place where you can fill the prescription that will deal with your pain. For many the church is therapeutic. The church as a big box retailer. Other people see the church as the place that offers the best products in a clean and safe environment for you and your family. The church offers great service at a low price—all in one stop. For many people, the church is a producer of programs for children and young people. To his list I would add other distorted images of the church: the church as social group, where we find belonging, pride, and even a means to social change; the church as nostalgia, a museum where history is preserved and its primary reason is to serve as a staging for precious family moments like baptisms, weddings, and funerals; and perhaps most inaccurately and perniciously, the church as building—a place that must be maintained. It matters how we think about “church,” because God has an opinion. And we can either be in line with God, or out of line with God. Instead of church as building or movie theater, God calls the church the body of Christ (1 Corinthians 12:27); the bride of Christ/wife of the Lamb (Revelation 21:9-10); the Jerusalem that is above (Galatians 4:26); the Israel of God (Galatians 6:16); a holy “temple” (but not a building! Ephesians 2:21); a chosen people, a royal priesthood, a holy nation, God’s special possession (1 Peter 2:9); and the flock of God (1 Peter 5:2). All this matters, because how we think of church plays out in how we practice our faith. For example, if we think of church as a movie theater for our entertainment, we will certainly have a strong opinion about the music and the quality of performance! If we think of church as big box retailer, we will certainly have a strong opinion about the “product” that the pastor provides for our consumption! And if we think of church as a building, then we will be unduly attached to bricks and mortar, sometimes at the expense of the people for whom Jesus died. But if we rightly conceive church as a chosen people who belong to God, then we will (hopefully) start to treat each other the way God treats us: with love, compassion, and forgiveness. And if we conceive church as a flock being guarded by the Great Shepherd, then we might be more likely to protect each other, rather than devour each other (Galatians 5:15)! So what do you think when you hear the word “church”? Is it distorted? Or is it in line with God? It matters! So Why Bother Going to Church? Many have written about Donald Miller’s admission that he doesn’t attend local churches much. He doesn’t “learn” anything relevant when he goes to church, and he doesn’t feel intimate with God through music. He doesn’t like the lecture-style of so many evangelical sermons. So he just doesn’t go most of the time. Miller casts his struggle as one of learning, and of the various styles of learning (kinesthetic, visual, auditory, etc. ), but his conflict is much more fundamental–and pernicious–than just a learning style issue. His struggle to participate in a worshiping community (aka a local church) is baked into the (evangelical) Protestant cake. It’s nearly impossible for contemporary American evangelical Christians (and even garden-variety Protestants) to speak about worship in terms other than “what we get out of it.” Learning, edification, inspiration, intimacy with God, and ahem, even entertainment: it all seems to orbit around the Almighty I. So kudos to Stephen Damick at Orthodoxy and Heterodoxy for his insightful response to Donald Miller. That’s a big question that I think is getting asked more and more by the unchurched, ex-churched, de-churched, the post-Evangelical, etc. If you don’t happen to get into the “style” of what’s going on at your church, why bother going? Certainly there are attempts to reinvent church, to make it more visual or kinesthetic, but what if you don’t connect there, either? Damick gets to the heart of things. There is often a fundamental misunderstanding of what worship is, and our role in it, in Protestantism. Besides giving a commercial for Eastern Orthodoxy, Damick advocates for a sacramental view of life and a liturgical approach to worship. At the most fundamental level, though, worship isn’t about learning or feeling anything at all—not according to the Bible or Church history, anyway. Rather, worship is about mystical union with God in the sacrificial unifying power of the liturgy, especially in the Holy Eucharist. There is both beauty and truth, the place where beauty and truth are authentically the same one thing. And that access to physical/spiritual communion with God is simply not available outside of the liturgical life. Miller has hit on something that is at the very core Evangelical worship, and that is that it only really appeals to a certain piece of humanity, and not just in terms of “demographics” (as he identifies it) but in terms of the human person himself. Contemporary Evangelical worship is not only addressed to certain kinds of people, but it is also addressed only to certain parts of people. So why bother going to church? If it’s about “what I get out of it,” then there really isn’t a compelling reason to–or at least no reason to remain faithful to a particular church, rather than jumping around attempting to suit my own desires. And if we understand “worship” as something we can do anywhere, like in nature or on the golf course, then there isn’t a compelling reason to darken the door of a church building. But if we understand worship as union with God (in community), then it is something we cannot experience apart from the gathered community. This is a wonderful set of graphics that compares financial data, state by state. There are lots of interesting comparisons waiting to be made. For instance, California has among the highest percentage of millionaires and the highest rate of those living in poverty. And just as an observation: this is evidence that we in the heartland have it pretty good (low housing costs, low unemployment, and good household incomes).